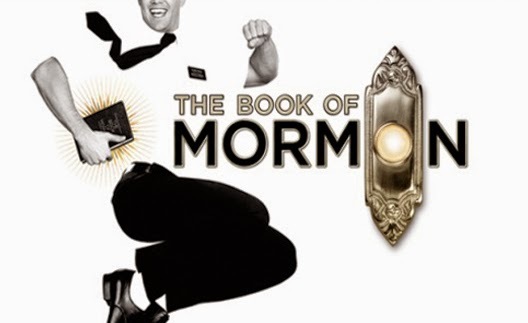 If you haven't heard of The Book of Mormon, you aren't really in tune with the Broadway scene. I'm serious. The show has won major awards since opening on Broadway in 2011 and has set ticket sale records for good reason. It's hilarious, smart and entertaining from start to finish. The satirical piece follows two Mormon missionary companions to Uganda. From their start at missionary camp through to the end of the story, there were laughs and 'I can't believe they just did that' moments. Elder Price and Elder Cunningham are two mismatched missionaries. Price is an overachieving overly-confident kid who believes he is God's gift to the world while Cunningham is a weird socially awkward guy with no friends and a penchant for lying. The two are sent to Uganda (much to Price's dismay because he wanted to be sent to Orlando) and well...if the jokes about Mormonism weren't un-PC enough, the jokes about Africa could take an easily offended person right over the edge. Luckily I'm not that easily offended. Most of the points that the creators were making were valid, even though they were done in a way that may not have been PC for most. I don't know enough, or really anything about Mormonism (besides the mission and the full bodied underwear they have to wear) to really discuss any of the criticisms in detail, but understand enough to know that - yeah, it does seem strange that Joseph Smith never showed anyone the gold plates. WHERE ARE THE GOLD PLATES. It was facts like that that the creators of the show really hammered into. I was really surprised how well they balanced the awful things that have happened in Africa (i.e. female circumcision, widespread AIDS, and warlord suppression of people) with humour. It was probably because they cut that tension right away with the first song when the missionaries arrived in Africa called Hasa Diga Eebowai. A saying that has the same purpose as Hakuna Matata from The Lion King, but then it turns out that when the Africans are feeling bad and upset the thing that they are saying to make themselves feel better was translated to 'F you God'. Much to the horror or the missionaries. When we left the theatre, I expected to see some horrified faces. We are living in one of the most conservative places in the country, so it wouldn't be too odd to see a few, but this audience didn't seem to phased by the whole thing. Maybe those people stayed away. The full run of the show, brought to us by Broadway Across Canada, in Calgary was sold out months before it arrived. *Unless of course you are a Mormon, in which case, I would suggest you not see it because you will most definitely be offended.